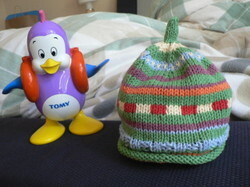 This is a hat pattern from Lucinda Guy's book (you guys, I am obsessed), but the gauge must be off because it is tiny. Since it won't fit Nutella and will likely stay in a gift pile (I have always had a dream of having a gift pile of little hats for friends having babies - maybe this will be the first one! ), it is second priority. 2.) When you get to the thumb, you have a total of 25 stitches, so on the 3 needles, you have 8,9,8 stitches (not 7,9,7) as written in the pattern. 3.) Turning the mitten inside out for the three needle bind off with needles still on it = dropping stitches and badness. 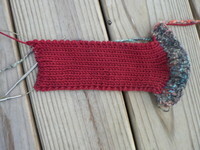 Better to put the live stitches on a holder/safety pin, turn the mitten inside out, and then put the stitches back on the needle. Okay, back to getting some work done so I have time to knit later! I felt my first earthquake in California last week. And in other news of amazing natural phenomena, I started a knitting project on Wednesday, and finished it last night (Saturday). WOW-WEE! Okay, okay, "really cute," she said. But, as I quote, she noted that she likes her stitches to look even, and "unless you knit like a robot," intarsia never looks even. I thought about this - all the way to my favorite LYS, which is 33 minutes from my house. So I decided I should do a test pattern, something smaller with some intarsia, to try it out. At Shuttles, Needles, and Hooks in Cary, the woman who owns the entire house of yarn gave me some pointers about holding one strand of yarn in each hand, to avoid areas that are too loose or too tight. On Wednesday morning, I left on an airplane to Riverside, California (where we had the earthquake, and ironically, Nutella saw her first snow - and it only snows there once every 15 years!). 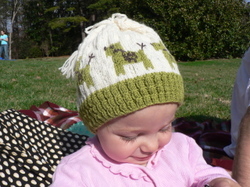 And I just whipped this cute little doggie hat up. I think staying in a hotel (allergic to the in-laws cats) and two long plane rides had a lot to do with it. It's not totally flat. But I definitely was able to keep a more consistent flatness when using only two colors and not three. Perhaps I could get this to lie more flat if I actually blocked it - anyone have any advice about that? Also, I am still no expert on the stranding in the back (how often would you pick up the strand in the back, if you had a run of one color?). And lastly, off-white/white is not an ideal main color when doing colorwork, because you may be able to just-slightly see the other strands running behind it. Overall, though, I think I am going to go ahead with another project from the Lucinda Guy book and push myself to get better at intarsia. What project next? A feminine version of the Dangerous Dinosaur Sweater, or maybe the Wildflower Sweater, or even perhaps, the Fantastic Flower frock with the flowers from the Wildflower Sweater? 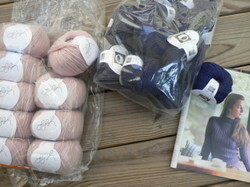 Well, maybe I should finish up the Debbie Bliss Teddy Bear sweater first. Huh. Maybe. Although we do not like to bring up bad memories here at Golden Needle, this nightmare had a happy ending. Remember the "knitting emergency," from a few weeks ago. When I...gulp...forgot my knitting during a ten day trip with lots of long airplane and car rides? Luckily, the knitting fairy must have been watching over me, and I coincidentally ran into a knitting store and was able to find a little project to hold me over. 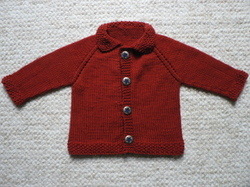 Roughly, I can remember that it is some kind of orange washable Cascade yarn, the cardigan was done on size 6's, and I knit this from the top down, which was very enjoyable because - YEP - you guessed, no seams to sew together! I did seed stitch around most of the edges (the button band is garter stitch), and the little yarn overs at the raglan edges are so cute. So - here's the dilemma. Thought I might make this pattern for my soon-to-be neice. 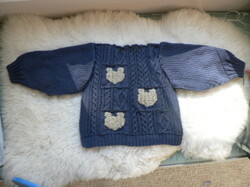 But now I like it so much, I want to keep it for my own little rugrat. Is that wrong? 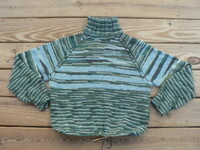 And remember the Raglan sweater I am knitting with the Brioche yarn from Art Fibers? Yeah, so, not done in the "jiffy" that I thought it would be...but it's growing, so I will try to get some photos of that. Maybe next month. No, just kidding, hopefully before then. My mommy and daddy took me all the way across the Atlantic Ocean! They wanted to introduce me to my great grandmother - it was so fun. While I was there, I got to meet ZoZo, who was due the same day as I was (but of course, he had the decency to show up a little sooner than I did!). What a cute guy - we even held hands! * His mommy is Sarah, from Bienvenue a Mon Monde. 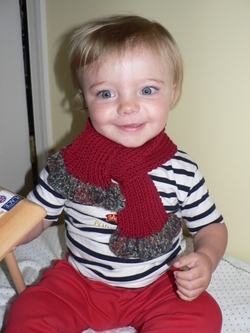 Look, Mommy has actually been doing a little bit of knitting. Here's a hat that she made for me. It's made from Berroco Soft Twist. And remember the pink kimono jacket she made me? Here I am wearing it (she can hardly believe it!). But what are you doing here? You should be looking at Alice's blog - ZoZo and I are going to have a new bilingual friend to play with! * We really missed Kate - but if you look closely, you can see Clapotis on my mom - so we were thinking of her! I took Alice's advice - and got back to knitting before I got back to my household chores! 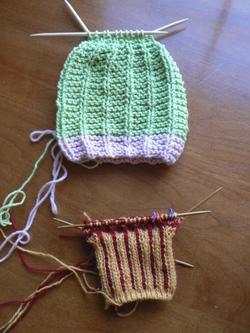 Here's a little hat ("Aran Ruffle") from Jill Eaton's Minnow Knits. 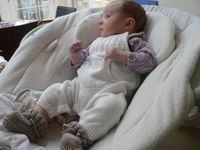 It's knit in the 6 month size, so it's still a little big for the little head, but I am sure she will fit in to it before I am ready! I used size 4 needles, and GGH Bali for it. It's a very very quick knit and the best part: my pregnancy-induced carpal tunnel is almost all gone! YAY for getting back to knitting!